The CR1000 is a new product resulting from literally millions of dollars of investment in product research and development. Part of that investment started with a sophisticated operating system architecture imported from the CR9000 and CR5000 dataloggers. Substantial investment went into development of an application specific integrated circuit (ASIC), Campbell Scientific's first, that expands pulse count, control port, and serial communications capabilities while maintaining accurate and orderly timing of measurements with hardware-driven task sequencing. In years to come, the benefits of this ASIC will be made available in additional models of dataloggers. The packaging of the instrument also represents an advance, with a stainless steel clamshell containing the more sensitive circuitry for environmental and radio frequency protection, similar to the stainless steel can of the CR10X. 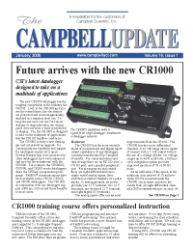 New attributes of the CR1000 operating system and LoggerNet 3.x support software include a CRBasic program editor with support of all CR1000 functions, and Campbell Scientific's PAKBUS® packet switched network communications protocol. Applications with serial or string data structures will be quicker and easier to implement in the future using CRBasic. In combination with other PAKBUS dataloggers and peripherals such as the NL100 Network Link Interface, the RF400 Spread Spectrum Radio, and the MD485 Multidrop Interface, doors will open for new applications. Sophisticated data structures, such as video images, can now be transmitted over complex networks. Different PCs running LoggerNet may be able to interrogate the same CR1000 at the same time. Autorouting will allow roaming nodes, which may be useful if a datalogger is on a moving vehicle. Autorouting may also provide for communications redundancy with selfrecovery should a link fail in a network designed with alternate communication paths. When using these advanced capabilities, you may want to consider some application engineering services and/or training from Campbell Scientific. As with any new instrument, some commitment of your time and attention will be needed to learn how to use it effectively. When you start on that next project, and if the CR1000 is the right fit, allocate some time or consider one of our structured training courses. Such an investment up front will surely pay dividends in the long run. We also have utility software to help with conversion of old applications, should you want to run them on a CR1000. Application engineers at Campbell Scientific have been busy with product testing and learning the nuances of this landmark product. They are now ready to assist customers with specifications, system integration, sales, and training. Just as the CR10 in 1987 and the CR10X in 1996 established standards of excellence among datalogger products, I am confident that the CR1000 will do the same with a respectable raising of the bar for performance and value.